Gulf South Medical Supply, serving all 50 of the United States, is the largest distributor of medical supplies to the Long-Term and Elder Care industries. With 14 distribution locations and 125 sales representatives, Gulf South offers over 20,000 products. With emergency orders delivered same day, and nonemergency delivered next day, Gulf South Medical Supply is reputable for meeting, and exceeding, expectations. Gulf South is operated by PSS World Medical, Inc., which was formed in 1983. PSS World Medical distributes medical supplies and equipment to office-based doctors and long-term health care providers. PSS World Medical, Inc. has also invested much time into helping communities. Just after the earthquake of Haiti, they pledged over one million dollars worth of supplies to Haiti Relief through the American Red Cross. They’ve also proven themselves a loyal company, being named one of Forbes’ “Top 100 Trustworthy Companies” in 2009. Through the products offered, Gulf South Medical primarily serves Long-Term Care, Home Health, and Hospice Care markets. Products, ordered on line or via phone, range to include Blood and Urine Testing, Housekeeping, Furniture and Equipment, Over the Counter Drugs, Orthopedic, and Diagnostic Supplies and Equipment. With the focus in mind of keeping costs down to companies, while helping raise revenues, Gulf South is actively involved in industry initiatives to provide better reimbursement opportunities for businesses. They’ve also formed Proclaim, their solution to Medicare Part B billing. They put focus on learning a companies preferences and understanding of the financial and clinical needs of the companies. 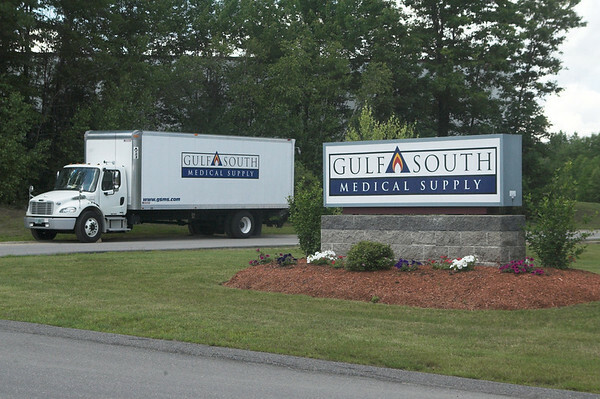 Gulf South Medical Supply, while other locations are scattered throughout the United States, has a distribution center in Londonderry, New Hampshire. The company is located at 14 North Wentworth Ave.
For more information about Gulf South Medical Supply, visit their website or contact them at (603) 537-2300.